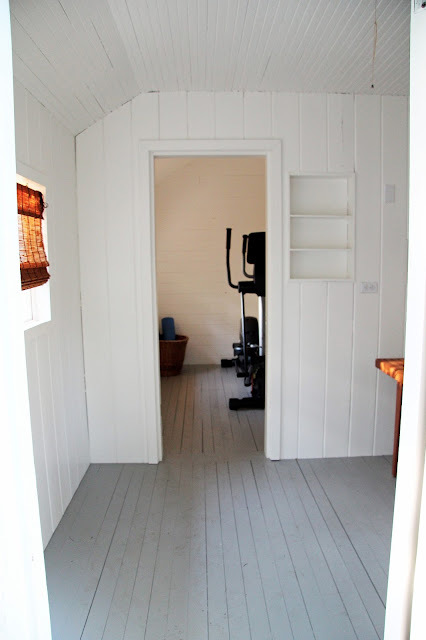 This little outbuilding used to be an old sauna. It was not functional when we bought the property. 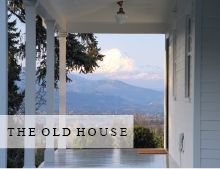 Rumor had it that it had almost burnt down several years back, and the makeshift stove, water heater and plumbing could only by described as 'a little scary' to borrow a sentiment from our home inspector. Below are the before photos of the interior after an initial clean. The back room had a nice tall vaulted ceiling. 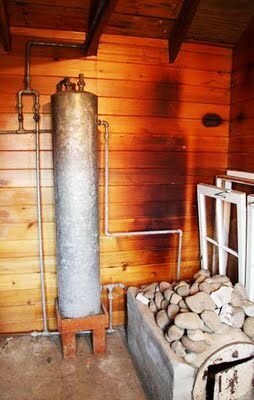 It also had a big concrete block with an old oil barrel turned wood stove in it, and the aforementioned plumbing, all of which Mike removed. We transformed the interior in a few phases over the years, but first we painted the pine paneling with Simply White by Benjamin Moore. We had some left over flooring from the wraparound porch that we used to install fir floors, which we recently painted platinum grey by Benjamin Moore. The blinds were also a recent addition. 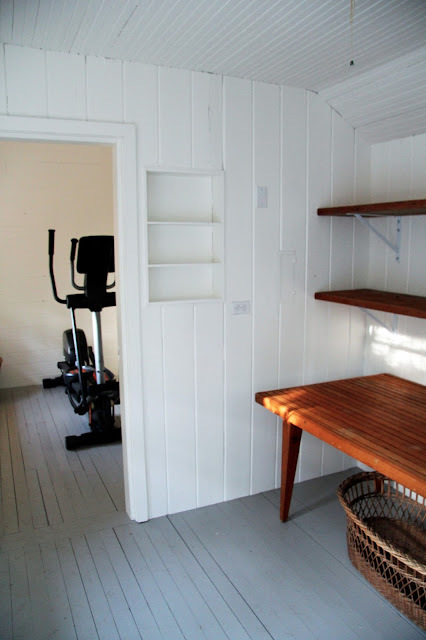 Mike used the old steam room benches to make shelves in the front room. He also insulated the ceiling in the vaulted room and added bead board over it. It's not pictured here, but the light in this room was rewired to go overhead with a small schoolhouse fixture. Our one and only TV, on which we play DVDs. The new Simpson door adds a lot of charm to the building. It goes nicely with the original six pane casement window. You can see my previous posts on the old sauna here and here. This post shows our last update last year. Wow..what some paint and a lot of love can do! What a great place to exercise, a beautiful calm space. 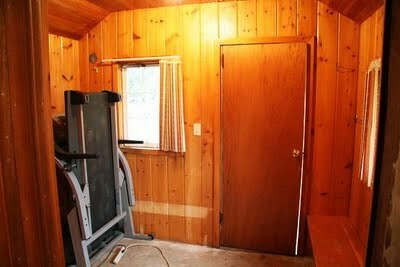 I should only have one TV in my exercise area too, then I may workout more. Love the grey floor. I hope that's a photo fromasy summer and your hydrangeas aren't already in full bloom. If they are I might cry in jealousy. Wow, what a big change. It is such a charming little place now with endless possibilities. I'd probably want to work out more if I had a little [lace like that. It looks so calming in there! Love the colors you chose. Well done! so pretty! what a wonderful place to escape to take a little time for yourself. 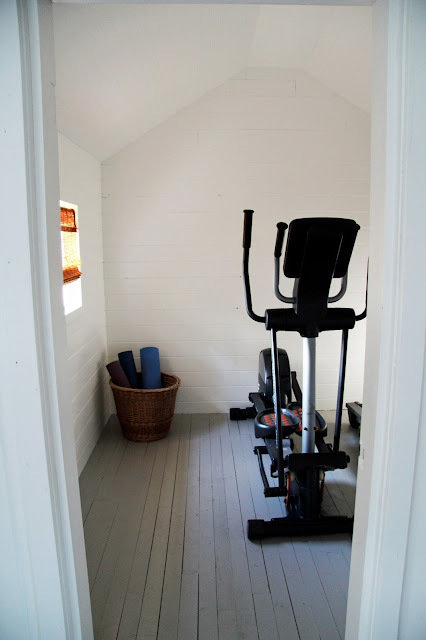 love your "little country farmhouse - at home gym"
It looks amazing ! I just love the charm ! Did you say your only tv is that in the main house to ? Hope you have a great start to your week !!!!! What a lovely transformation. I'm always amazed at how much changing the color of something can soothe the space. Lovely! I think that's great ! More family time tv is terrible in today's world I can't think of one show a family with kids can watch . With the varnished wood paneling, did you have to sand it down first before painting it? Hi! 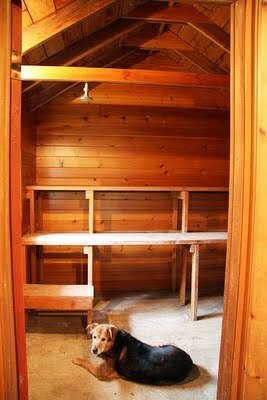 I noticed in your sauna photos there was a picture of Lucy. I had not seen her in any recent posts. I hate to ask in case something happened, but do you still have her? 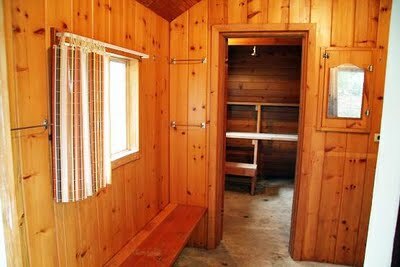 You and Mike did an amazing job on the sauna makeover. Wish you and your family all the best with your upcoming move. Charming - who wouldn't want to exercise in such a sweet space? Love it. I have absolutely loved seeing your beautiful home over the last few years! Thank you for so generously sharing it with us. You have such a great eye for recognizing and creating beauty. And I love the fact that you only have one tv - and it is in an out building! Your children will be better off for that! I have three boys (4, 9 and 12)and while we limit tv and video games - I wish we had none of it. I am sure all that stuff does not benefit kids and I think hurts them. And if tv is not in the house - you as a mom have an easier job of saying no tv! I am impressed! Nice. How lucky you are to have this pre built little house. I admire you for not having a TV in your home. Our niece and her husband have a 3-year-old son, and they don't have a TV either. I think it's good for young children to not be exposed to television. Question: does your home have a garage, or do you store your lawn mower and other yard equipment in the barn (the guest quarters are on the upper floor of the barn, correct?). The two of you seem to have the right vision and psazzz to change something dark and gloomy into something light and fantastic. Such a wonderful team you are . . . Magical....it's all I can think of to say...simply magical. Brilliant! EWWQW that orange-stained wood!! Isn't there any way we can just put a stop to it? My grandchildren's playhouse arrived from England; inside and out! EWWWW!! someone in charge who is NOT colorblind!! un très bel espace récupéré, jolie transformation ! Ummm that is the cutest little gym I've ever seen!! Awesome job guys!! 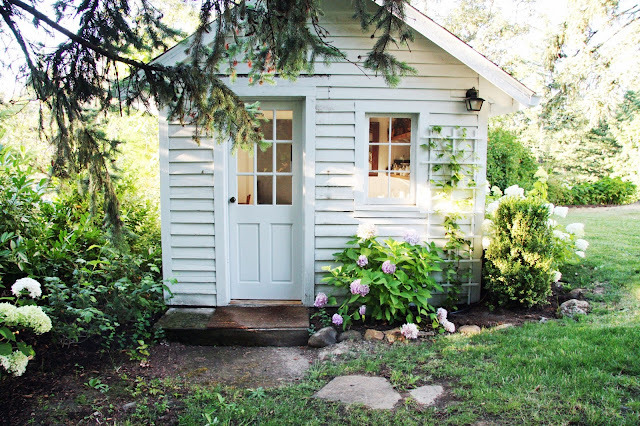 What a fantastic job and repurposed little cottage-it all looks just wonderful. Ummm that is the cutest little gym I've ever seen!! Awesome job guys!! LOVE it! It looks peaceful and serene, as usual. Wondering what primer you used on the paneling? The primer was Benjamin Moore - no VOC primer. 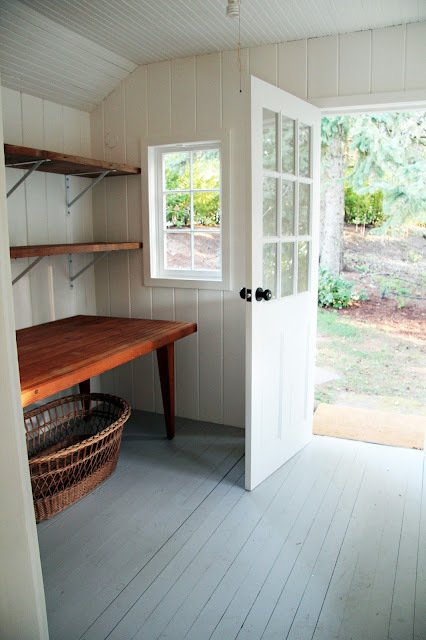 It looks beautiful - so fresh, clean and bright - and I love the repurposed shelves. The hydrangeas blooming are so gorgeous... oh, I'm anxious for those summer blooms! This is AMAZING!! WOW I am most impressed!! I would love to hide out in a space like that...I might never come out, lol! Simply lovely. I can't imagine how many hours Mike put in on this project. I'd think installing beadboard on a ceiling would be awkward, not just time-consuming. I didn't know your family had only one TV, but that's like you to be thoughtful about things like that, and it does make the time pass when you're exercising. Again, gorgeous, and kudos to Mike. I don't have a TV at all - haven't for the last 11 years - and I have 3 children ages 5-13. TV is useless these days - nothing I want my kids watching. I don't have a TV at all - haven't for the last 11 years - and I have 3 children ages 5-13. Nothing on TV I want my children seeing. So charming! This is such a sweet little getaway. 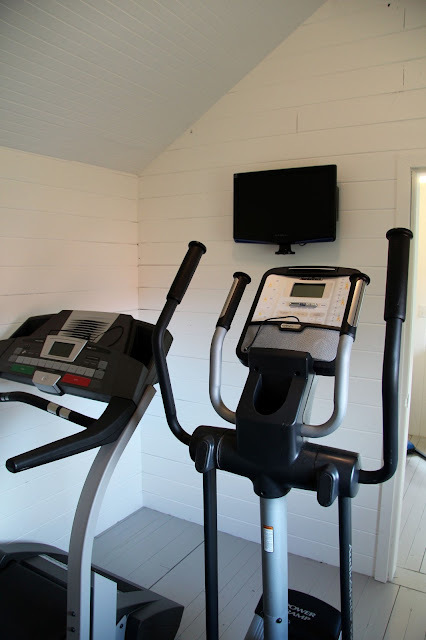 you're really lucky to have this special space to do be your fitness sutdio. If ever I have the chance to have my own studio i'd put more window installation. thanks for posting this! Is the exterior painted "simply white" also? Thank you!